Zoom is designed exclusively for hosting webinars, teaching online courses, and conducting online training, video demonstrations, virtual meetings and video conference; and represents an easy to use online video conferencing and meeting software that integrates video conferencing, simple online meetings, and group messaging into a single cloud-based platform. Helpful for small to medium businesses, enterprises, educational institutions, and healthcare organizations; Zoom is built to host and broadcast online meetings that can cater to up to 100 interactive video participants and 10,000 view-only attendees. Offering quality video, audio, and screen-sharing capabilities and experiences, Zoom improves collaboration among teams, remote employees, and participants as they are able to start and join a meeting instantly with just one-touch of their mobile devices or browsers. 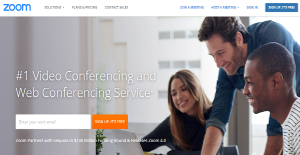 Furthermore, this web conferencing software facilitates content sharing in wireless mode as it enhances remote access to webinars and web conference. A prominent feature of Zoom is its video webinar functionality. The size of the participants that video webinars can cater into is scalable ranging from 100 to 10, 000 view-only attendees and 100 interactive video participants. With this feature, users can invite other participants to join the webinar as URL link is generated by the software that can be copied and posted to social media platforms and instant messengers. They can also invite them through email which is done instantly through integrations with email clients and software. Zoom’s cloud video conferencing capability contributes to the dynamic hosting of webinars. Such capability allows the viewing of both panelists screen and presentation screen which is referred to as dual screen support system. It also has an HD video and HD voice with dynamic voice detection functionality. Another component of the video conferencing functionality of this software that enhances webinars is its dynamic screen-sharing. Users can share their entire desktop screen with their audience, an active window in their browser,or a whiteboard with illustrations and diagrams. Zoom’s video webinar functionality improves remote access to webinars and content sharing and thus facilitates the broadcast of educational, corporate, or organizational discussions. Another feature of Zoom is its group collaboration functionality. With this feature, users can create groups and instantly send text, image, or audio files to the members of those groups. Furthermore, they can invite others to join their group and receive an access through their smartphones. Its drag and drop capability allows users to share files instantly such as documents, photos, or video clips. While sharing files, users can annotate or co-annotate them allowing the adding of notes or comments on documents. Group video meetings can also be conducted effortlessly wherein the host can screen-share from their desktop or mobile device. This feature improves teamwork and collaboration and eliminates communication barriers among teams and employees. Zoom also has a unique functionality that allows users to record their virtual meetings in MP4 and M4A video formats which is possible both through the web or mobile devices. This cloud and local recording of meetings makes it easier for users to store their video clips for future reference and indeed it makes the entire process of video recording hassle- free and cost-effective as they no longer would need third-party recording devices to capture the coverage of their meetings. There are trendy and widely used systems in each software category. But are they necessarily the best fit for your enterprise’s unique needs? A trendy software product may have thousands of customers, but does it present what you need? For this reason, do not blindly shell out for popular systems. Read at least a few Zoom reviews and think about the factors that you wish to have in the software such as the price, main tools, available integrations etc. Then, choose a few systems that fit your needs. Check out the free trials of these products, read online comments, get clarifications from the seller, and do your investigation systematically. This in-depth research is sure to help you find the finest software application for your organization’s special requirements. How Much Does Zoom Cost? We realize that when you make a decision to buy Video Conferencing Software it’s important not only to see how experts evaluate it in their reviews, but also to find out if the real people and companies that buy it are actually satisfied with the product. That’s why we’ve created our behavior-based Customer Satisfaction Algorithm™ that gathers customer reviews, comments and Zoom reviews across a wide range of social media sites. The data is then presented in an easy to digest form showing how many people had positive and negative experience with Zoom. With that information at hand you should be equipped to make an informed buying decision that you won’t regret. What are Zoom pricing details? What integrations are available for Zoom? Pros: It is an efficient tool whens you want to use it for your meetings or communications or collaboration purposes. It helps to make your work easier by bringing all the related parties on board regardless of where they are. You can send an invitation for someone to join a meeting and collaborate remotely with them. With the mobile application in place, you can install the app on your mobile phone and manage your meetings from there. Whether you are at home or at a coffee shop, you can use mobile broadband or Wi-Fi to connect and hold a successful meeting. It integrates with Google calendar, which adds to how reliable it can be. Cons: The functionality that comes with tool is impressive. When you want to hold meeting, you can do so with ease regardless of how stable your internet connection is. The quality of the video and chat are great which adds to how easy is to use it. In that case, there is very little to dislike about this product. However I think that more awareness on how and when to use the dial-up and app should be created by the developers of the tool. This is because, some users end up using the dial-up when they have the app in their mobile phones. Other than that, it is a flexible that that makes multiple things possible in an easy manner. Pros: It has become the focal point of my work. With this tool, I am able to do things that I thought would not be possible in such an easy way. I have to hold marketing webinars online and also consultations with clients on different marketing projects. With such a workload, you will need a tool that takes care of business regardless of where everyone is. Zoom has made that possible with its flexible features built-in to work as promised. I can hold meetings remotely with team members in a collaborative manner. We are able to share ideas, contribute to projects and find a way forward with ease all thanks to Zoom. Cons: Ideal with clients from all walks of life. Whenever I want to hold a meeting using this tool, it can be difficult to take them through on how to go about. The tool can have quite a learning curve for those users who are not tech savvy. As such holding meetings with clients can be a tough nut to crack. It would be better if the developers of the tool had a page which shows a stepwise guideline son how to join a meeting when invited by another user. This would help make it easy for people to navigate the features associated with this tool. In some cases, I cannot hold meetings on Zoom and I am forced to call that client over the phone instead. If you need more information about Zoom or you simply have a question let us know what you need and we’ll forward your request directly to the vendor.